A Monday morning edit: My friend Liz left me a nice comment and also let me know about the challenge blog One Stitch at a Time. I hopped over there to check out the goings on, read the rules and am going to enter my picture frame since I posted it on the same day as their challenge started. Looks like it's going to be a fun place to play, Liz knows how I love challenges, if you haven't found them click on the link, you wouldn't want to miss some fun. Happy Easter everyone, a day to celebrate new beginnings. Speaking of new beginnings, the happy young couple you see in this photo were starting the beginning of a 41 yr. and counting life together. You may have guessed, Yes, that is me and my husband, but I still call him my boyfriend. Down through the years people have wanted to see our wedding photos, of which, there are none because the only people at our wedding were the preacher, Chuck and myself, the church secretary witnessed the paper work and went to lunch. Long story short when Project Tuesday called for an altered picture frame I thought of this one little faded picture taken of us at his Mom's house right before he shipped out to Norfolk, Va. I followed shortly thereafter with 2 suitcases, a makeup bag, and my purse, oh my, Sept. 1968 a very good year. This will be the closest there will ever be to a wedding photo of us. I'm going to try to sneak this into Artful Inkable challenge also, Book or Album Cover Inspiration, maybe they'll take this poem. It is in a book of poems by Browning, the only cover I could find simply said Poems by Robert Browning. Oh, by the way, the flower there is made from the scraps I cut off making the curve inside the heart. 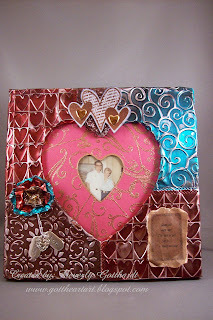 Supplies: Wood Frame from Michael's, Colored foils, Papers: from my scrap box, Stamps: Autumn Leaves-Scribbles hearts and stars, CTMH-D1212 Playful Flourishes, Ink: VersaMark ink pad, Ranger Alcohol Ink-Expresso, JudiKins copper embossing powder, Cuttlebug embossing folders-D'vine Swirl, Heart Blocks, Stampin Up Textured Impressions-Finial Press, Sentiment generated in PrintMaster 11, Craf-T Metallic Rub-ons-Amber, Fiskars shape cutting template-heart, Elmer's Copper Leafing Pen, Blue Moon Beads-word charms, Jewelry Essentials-heart charm, heart brads unknown, Terrickly Tacky Tape, glue dots, pop dots. What a great frame!!!! I love how you used all the different cuttlebug folders. And, how great of an idea to add the poem on it!!! Thanks for playing along with us at Project Tuesday!!! wow, this is gorgeous, great job with the frame....hope you have a day filled with sunshine! This is a fabulous frame. Thanks for joining us over at Project Tuesday. Beautiful frame Beverly! How cool, I just LOVE the fun use of the Cuttlebug and shading = WOW! 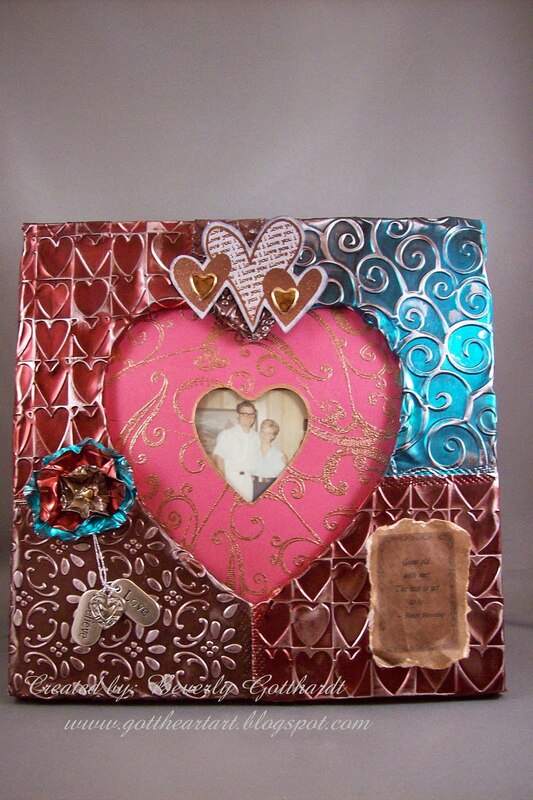 What a lovely story, and that lovely picture was taken all those years ago waiting for you to make this lovely frame! Thank you for joining OSAAT's Anything goes Challenge! Hi hun. Thanks for joining us here at OSAAT. I hope you'll come back and check out our winners and our next challenge on Sunday. This is just lovely! Thanks so much for playing along with us at Artful INKables! Wowzers!! What a gorgeous project. Glad you joined us at OSAAT!! Hope you will come back and play again!